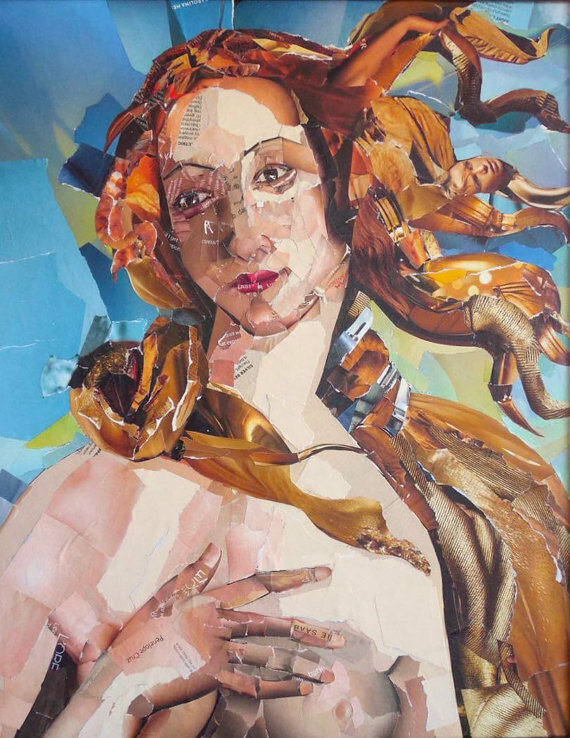 I am primarily an oil painter, but I also enjoy doing collage. Collage art is much harder than using paint. You have to give the observer enough information to make out what the subject is, and if it’s a portrait it is really a big challenge. I use good-quality magazines, and when I start I spend a very long time finding pieces to tear out that I may possibly use. I put them in piles according to color; if I am doing a black and white collage, which is easier than color, I put them in piles according to value. I always start with order and good intentions, but before it’s over I have paper everywhere and it all gets mixed up. I get too excited as I find various pieces and before I know it it’s a messy pile. I draw my sketch on the canvas, then I draw over it with a Sharpie. I put down the biggest shapes first, usually the background, using Liquitex Matte Medium and my fingers. I don’t use a brush, I find it just gets in the way and my fingers are going to be a mess anyway. I put medium on both the canvas and the back of the piece of paper, put it in place, smooth it down, and then put more medium on top of it. If it looks wrinkly it adds character, so I don’t worry about that. After the whole thing is done and dry, I varnish with Golden Varnish with UV protection. At this point the collage is virtually indestructible. I should add that if you are very obsessive, neat, and orderly, you probably won’t like this medium! I use the Gojo Barrier Lotion on my hands before I begin. It helps a little for getting the medium off my hands later. Nothing really keeps it all off. I wash my hands with Dawn and a scrubber. The Liquitex Matte Medium is for gluing the paper down, and I pour it in a shallow container; the Golden UV Varnish is the final step, a protective varnish. I choose my papers carefully. Some papers are just too thin and transparent. Vogue and W are good magazines to use. Some people do a completely different kind of collage and use tissue paper or art papers with lots of fiber in them, but that wouldn’t do for my kind of collage. You must be willing to get messy. Be patient, it can be a long process. Much more time is spent looking for the right piece of paper than applying it. Don’t forget to step way back and look at it to see if the colors and values are actually forming a picture. Start with a black and white collage. It’s easier. And, as my teacher stressed: don’t use the thing for the thing. In other words, if you are making lips, don’t cut out a picture of lips and use it. It can look quite creepy and ruin the whole thing. To be a collage artist, you must be patient, a hard worker, and willing to get very messy. 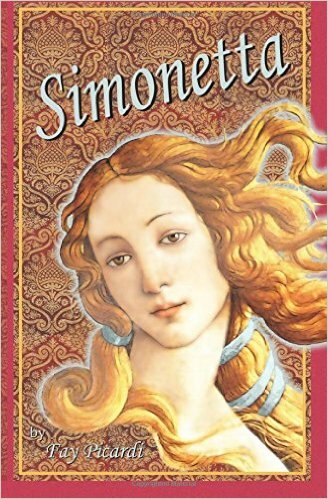 Simonetta was the beauty who is believed to be the model for Sandro Botticelli’s famous painting, “Birth of Venus.” Her beauty was so renowned that she was painted frequently during her short life. It was the time of the Medici’s in Florence during the Italian Renaissance, and art and beauty were much revered. Simonetta was the cousin of Amerigo Vespucci, namesake of our country. 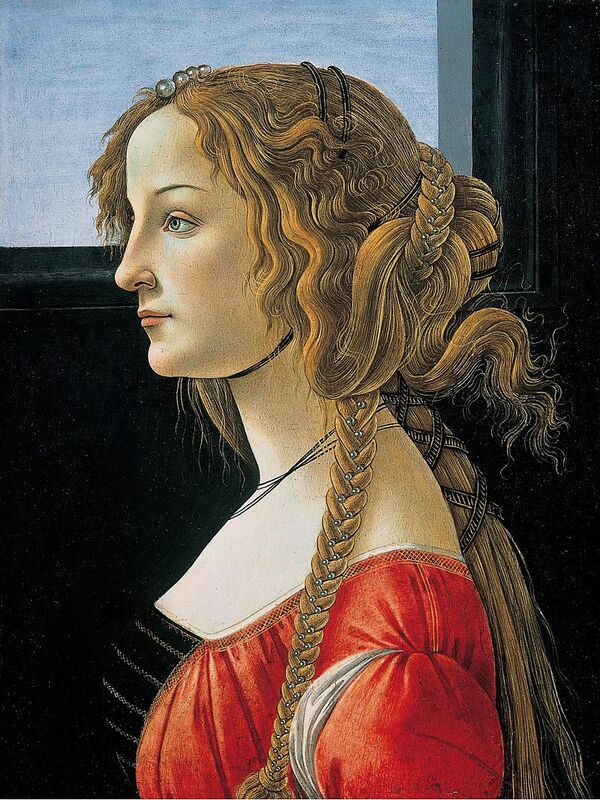 Botticelli painted several portraits of her. 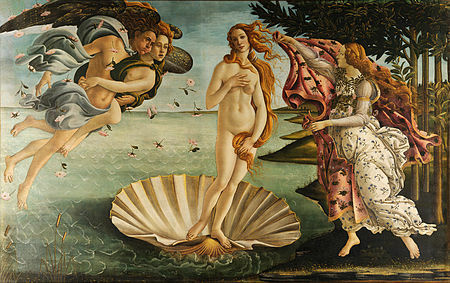 How amazed Botticelli would be to see his image of Simonetta in “Birth of Venus” plastered everywhere in Florence and in art museum gift shops around the world! 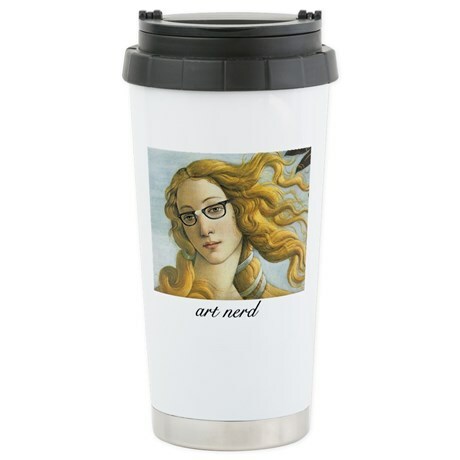 The exquisite artwork is now used on items like this, and I actually am glad that it is. Anything that keeps art in front of people, even tongue in cheek, is fine with me. When Fay asked if I would do artwork for her book launch, I didn’t want to do an exact reproduction, so I decided the next best thing would be a collage. Oh, how I am a glutton for punishment! It takes me three times longer to do a collage than an oil painting, and destroys my studio with paper everywhere. I begin with the intention of staying organized, but it always deteriorates as I go along. I get too excited when I find that just-right piece, and I maniacally shuffle and dig through magazine pages and pieces for the next one. This is the finished product, ready for the book launch on November 6 in the Eau Gallie Arts District of Melbourne, Florida. A plug for the book: it’s available on Amazon. A plug for my collage: it’s available in my Etsy Shop.